The Linhaye in South West England a perfect base for your holiday in Cornwall. Find out more about The Linhaye below. A comfortable detached single storey cottage in lovely countryside, converted from a wagon house of natural stone and slate, to one side of the entrance of Pollingarrow Farm near the picturesque village of St Kew and only a 10 minute drive from the sandy beaches of the Camel Estuary. St Kew Highway, about five minutes drive, has a pub, garage, and mini market, the village of St Kew about 3 / 4 mile has a pretty church and an old pub that offers good pub food and there is a 9 hole golf course 1 mile away. The Linhaye is family friendly self catering. We have the following details listed regarding The Linhaye accommodation accessibility but we would recommend that you always confirm these prior to booking with the owner or operator. The Linhaye is a great base to explore the wonders of Cornwall and you will find plenty of activities near by. The Linhaye is at St Kew, Cornwall. Check out the map below for directions, use the controls to zoom in. "Very friendly, lovely and quiet, everything for a relaxing holiday"
"Very clean and cosy. A real home from home. A good base to explore from. Owners were very welcoming,..."
"A very attractive, cosy, comfortable cottage. Peaceful location with lovely view over back garden and..."
"A cream tea on arrival, perfect start to our honeymoon. Clean and cosy, perfect size for two!" "Lovely cottage, very private and not overlooked. Would definitely recommend to a friend." If you have stayed at The Linhaye why not add your thoughts, comments, pictures to our Facebook page? Don't forget to add the name/town/page link to your comment so its attributed to the correct place. Please keep it polite, we are sensitive souls! Find Cottage Holidays works closely with independent cottage owners and leading holiday travel operators to provide you the widest choice of self catering accommodation across England. 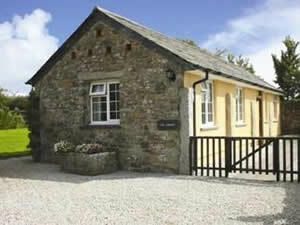 The Linhaye in Cornwall is available through: Cornish Cottages.